When I was told that I would have the opportunity to be a guest of the David A. Straz, Jr. Center for the Performing Arts on the opening night of Flashdance, The Musical, I was so excited! 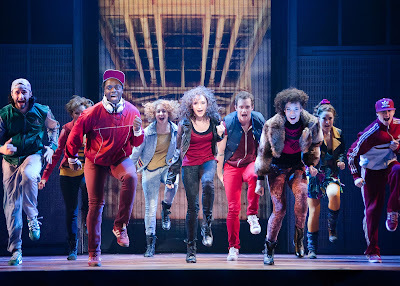 Flashdance will be running at the Straz Center until the 24th. Don't miss it! The first thing that I thought of was how often I did the Maniac dance in my bedroom when I was a little girl while wearing my leotard and leg warmers. I immediately called the woman who put up with all of my dreams as a child, my mom, and invited her to be my guest to the show. When a few of my friends mentioned dressing up for the night, I was so excited! I am typically not a dress up/Halloween type of person, but I couldn't resist cutting up a sweatshirt from the thrift store and finding some leg warmers to wear! And I did just that! As my mom and I walked up to the box office, one woman asked if she could take a picture of my leg warmers. I thought it was great. I didn't mind being the reason that someone got a good laugh. We jokingly told her that we had to hurry up because I was the understudy! We met my other friends and bloggers at the box office. There we were asked for a group picture too. It was so much fun! 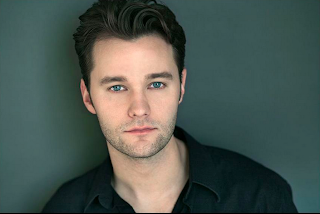 Matthew Hydzik played the handsome Nick Hurley. Nick is the love interest for the lead, Alex. Matthew stole the stage when he was singing. I couldn't take my eyes off him. At one point he said something about her not wanting him, and my mom leaned over and said, "I'll take him!" I couldn't have agreed more. He was adorable and talented! 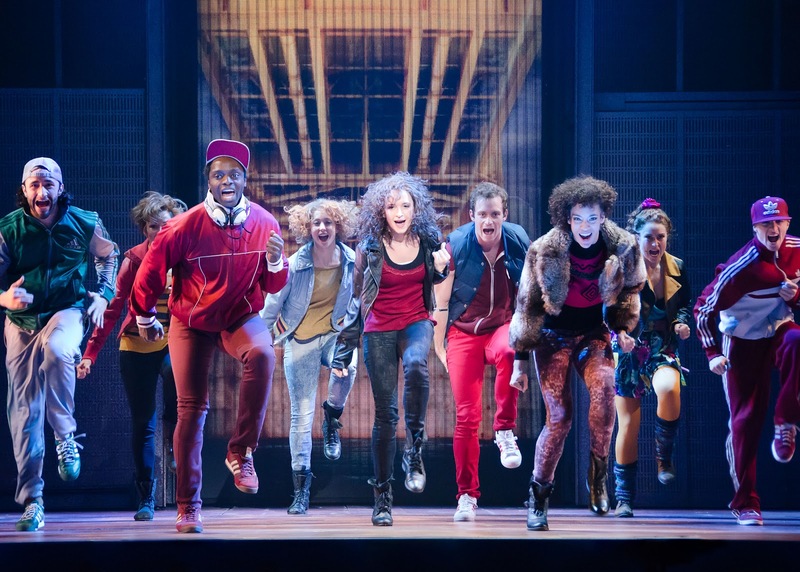 FLASHDANCE, the pop culture phenomenon and runaway international success, is now live on stage! It all started with a dream. To be bigger. To burn brighter. To dance harder. Now is the time to live the dream all over again. Based on the movie that defined a generation,FLASHDANCE – The Musical tells the unforgettable story of Alex, a working-class girl from Pittsburgh striving to make her dreams of becoming a professional dancer a reality. Directed and choreographed by Sergio Trujillo (Jersey Boys, Memphis, The Addams Family), this new musical features a score of smash hits including the Academy Award-winning title track “Flashdance - What a Feeling,” “Maniac,” “I Love Rock & Roll,” along with 16 original songs. Experience the magic all over again. 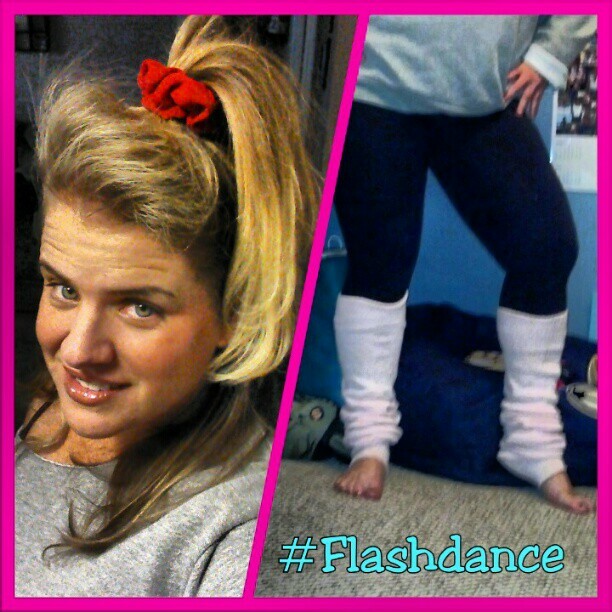 FLASHDANCE will leave you begging for more! And don't forget to enter my FitnessGlo 90-day online membership giveaway! Thanks... it was so much fun to get dressed up and be silly! :) Thanks Joanna! It was fun! I looked goofy, but I didn't care and that is an improvement. I used to spend a lot of time caring about what people think... DONE! No more of that! Congrats on your dietbet Mindy!! You are awesome!! Congrats on the Dietbet! I knew you would make it happen! I won too! Thanks for turning me on to it! I love your 80s look, so much fun. I would have so gone with you if I lived in FL. Too bad we didn't win that helicopter $. ooh I love Flashdance! I remember doing the dance in my bedroom, too! Congrats on winning the DietBet. That was fun! I would so love to see Flashdance! And I would totally dress up. Like, ya know? Lucky duck! Congrats on the DietBet win! You guys look awesome, I bet the play was a lot of fun to see and even more fun to get dressed up for. And you're right- the lead male is adorable! 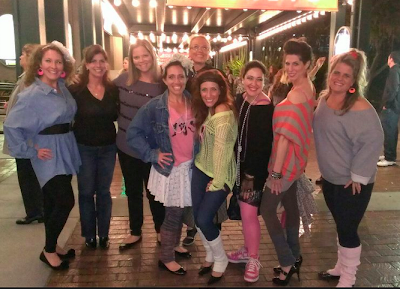 You are just way too cute with your 80s self! Congrats on winning the Dietbet; you rock! !